These primary personnel are assisted by a number of other talented BT staff. Since 1985 Bowen Technovation has established a successful track record designing, installing and supporting systems and software for unique audio and visual experiences. Our staff combines interest and experience in creative, as well as technical, project work…work that has lined our walls with international awards and filled our files with letters of recommendation. So we proudly and sincerely welcome you to share with us in development of more interesting and entertaining aural and visual world. 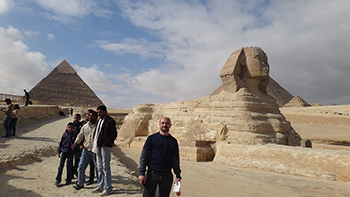 Jeff is an avid history student and was an honors biochemistry major at the University of Illinois. Since 1985 he has pioneered new technologies and content production methods for audio and video as applied to museum, science center, planetarium, large format film theaters, and educational applications and even NFL sports facilities. Jeff and his staff have designed and installed audio-lighting-control systems and shows in over 300 domed theaters worldwide and have complete a total of over 600 projects of varying scale. As a composer and system designer, he has pioneered many new concepts of synchronized digital audio and video for sound recording, planetarium, and exhibit applications. He speaks often to student groups, and conducts sound design workshops at numerous planetarium, video production, and museum conferences. His 400 page CD-ROM interactive book “Becoming a Computer Musician” (published by Macmillan Computer Publishing in English and Spanish) became a resource often used in collegiate electronic music courses. Jeff and his staff develop and/or manufacture many of their own equipment and software technologies and among notable projects have designed and installed systems on all contents (except Antarctica!) including projects in England, China, Mexico, Ireland, Canada, India, Egypt, Jordan, and throughout the USA and Europe. One of their large scale 100-exhibit museum projects was selected for the ProA/V Magazine Top Ten Award for Sound System Design. Formerly an Emmy award winning show producer and composer, Jeff designed soundtracks for over 100 educational TV programs and served as producer of the first three panoramic video multimedia shows to be designed for the very first Spitz Electric Sky Immersive Visualization Theatre at Northern Lights Centre in the Canadian Yukon. He is honored to have been named as a Fellow by the Great Lakes Planetarium Association and the International Planetarium Society. In 2001, Diana Bowen completed a successful 23 year career as a Vice President and Division Manager with a large banking corporation, and now manages the daily and strategic finances and contract designs of our company. She is well-known by our vendors and clients as she handled duties for us on a part-time basis since 1985 and has attended various conferences and trade shows with Jeff. The 1978 graduate of the School of Business and Finance at Anderson University also studied at American University in Washington, DC and worked as a researcher in the Congressional Budget Office. Passionate about the living conditions of animals and the environment, she typically is accompanied to work by one of the Bowen family pooches. Mark has an extensive background in museum and planetarium work that spans twenty-five years. At Louisiana Tech University in Ruston Louisiana he was a Mechanical Engineering major and began his planetarium career as a student worker and later as director of the university's planetarium. From there he returned to his hometown of Shreveport, LA to direct the city's planetarium for ten years. As the planetarium curator for the Audubon Louisiana Nature Center in New Orleans he was responsible for the programming and financial success of the planetarium as well as maintaining exhibits throughout the center. He also has worked as Operations Director for a major audio visual company where he was directly responsible for the daily operation and supervision of all technical staff, hotel audio/visual managers and scheduling for road shows. In addition to his planetarium career he has also worked on design and fabrication in the archery business including writing software for calculating energy storage efficiencies of various bow designs. Mark is also a certified Barco CRT Technician and is Certified for AMX Control System Design and Installation. Mark's years of planetarium, museum and audio visual experience is complementary to Bowen Technovation commitment to quality equipment, design and service. Brian joins our staff after working for 15 years at a local rental and staging company. He has an extensive background in custom case design, inventory / warehouse management, rack design, purchasing, and event logistics. Brian was also a frequent participant of many tradeshows including the National Association of Broadcasters ( NAB ), InfoComm ( ICIA ), and Lighting Dimensions International ( LDI ). During these tradeshows he attended many industry specific training classes, as well as met one on one with manufactures to evaluate the technologies that would be used in events nationwide. Brian attended IUPUI in Indianapolis with an emphasis in History and Music. While at IUPUI he played trombone in the basketball pep band, symphonic band, as well as the University of Indianapolis Studio Jazz Lab Band. Since 1990, Brian has been involved with the world's largest creative problem solving organization – Destination Imagination ( DI ). During this time he served as a team member for 6 years, including a 2 nd place finish in the 1994 World Finals competition with Purdue University of West Lafayette, Indiana. Since retiring from competition, Brian has volunteered his time as an official and serves on the Indiana Creative Problem Solving Board of Directors. Brian enjoys all things sports, listening to Jazz, and most of all, spending as much time with his young son. Brien very well may be the person who has configured and tested your new Bowen FXCreator audio/video editing system. His solid education in audio and video production began with chasing and receiving a BA in Telecommunications/Minor Studies in Film at Ball State University. He is also a holder of multiple Advanced Master Class Certifications from the well-known Recording Workshop (Chillicothe, OH) including Recording Engineering & Music Production Program, Studio Maintenance & Troubleshooting Program, and Advanced Recording Engineering & Music Production Program. His knowledge of digital production software is extensive and includes the Adobe Digital Video Suite Pro (Photoshop, Premier, Audition), Illustrator, Media 100, Vegas, ProTools, Avid, 3D Max, Digital Performer, Peak, and Spark. 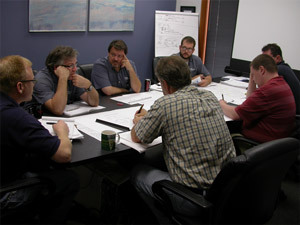 Brien is also a certified Barco Technician, a Soundweb Designer, and Xantech Design certified. 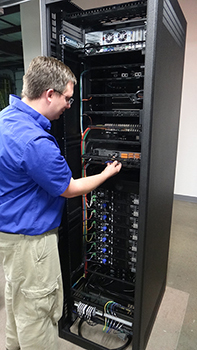 Brien also is experienced in wiring, installation, and programming of our most advanced surround audio systems. David is well known as a former staff engineer/technician at Taylor Museum of the Rockies in Bozeman, MT. He lately served Taylor as Planetarium Manager, Show programmer and Presenter. 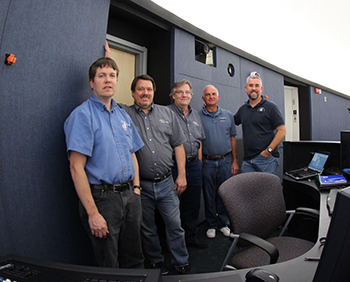 As the Planetarium Technical Coordinator, he maintained, troubleshot, and repaired planetarium equipment, which includes Digistar astronomy projection systems, planetarium automation, sound, and laser systems and designed modified, and installed special effect, electronic, mechanical, and optical equipment. He also provided audiovisual, electronic, and IT technical support and advice for other Museum departments. David was enlisted for four years active duty in the USMC and trained in electronics and teletype repair. He served one year over seas in Okinawa and Korea and also served six months active reserves, in the Marine 4th Recon Battalion, Billings, MT where he was promoted to rank of Corporal. He holds a BS in Electrical and Electronic Engineering Technology, Montana State University and is assistant Scout Master, Troop 649, Belgrade MT, is VP of Southwest Montana Astronomical Society, and has been a Digistar Users Group member since 1994. At Bowen Technovation, David works with exhibit and planetarium control system design and programming as well as with design of new BT electronic hardware packages and assisting with customer support. Matt joins the BT staff after 5 years of experience with a production company based in Indianapolis. During his experience as an audio technician, he was involved with the design, load-in, running, and load-out of shows with large-scale audio line array systems for “rock show” concerts down to small systems for board room and conference settings. He was also a valuable asset in providing support in the lighting, rigging, staging, and trussing departments. He graduated from Wright State University in Dayton, Ohio with a Bachelors Degree in Theater Design/Technology with emphasis in Sound Design. He gained experience designing and engineering audio systems and soundtracks for musicals and other theatrical productions both at WSU and for local community theaters. He was also the Studio Engineer for an accompanying CD for Phonics For Dummies publication. Since 2004, Matt has spent Christmas at St. John Bosco Boys Home in Mandeville, Jamaica. Along with helping to make a positive difference in the lives of 150 disadvantaged, delinquent, and orphaned boys, he has designed, installed, and maintained multiple video surveillance and audio systems. At a young age, he developed strong leadership skills through the Boy Scouts of America and attained the rank of Eagle Scout. He is currently an Assistant Scoutmaster for Troop 462 in Indianapolis and a Unit Commissioner for Pathfinder District. James returns to Indianapolis with a variety of background experiences in theatre, opera, dance, concerts, and event management. He graduated from Wright State University in Dayton, Ohio in 2008 with a Bachelor’s Degree in Theatre Studies with an emphasis in Lighting Design and Production, studying lighting design and programming of automated lighting fixtures and media servers Prior to coming to Bowen Technovation, he worked several years with a major nationwide event technology company supporting large and small meetings, conferences, and social events in all aspects of technology including audio, lighting, tele/videoconferencing, computers, rigging, and video presentation needs. He is Aerial Lift Operator certified, fluently knows gear, and most recently completed a new certification in Medialon show control. At BT James will design and install systems for our clients as well as working with them for system training and support. In his free time, he enjoys relaxing with a good movie or football game, camping, backpacking, and is considering running a half-marathon sometime in the next year or two. Erich has come to work for BowenTechnovation after attending Lincoln Technical Institute where he received his diploma and multiple rigourous certifications as an (EST) Electrical System Technician. He also has received his (NCCER) National Center For Construction Education And Research Certificates. He manages the Bowen system production team and keeps his hands in most of the higher level rack design and build. It is not uncommon to see him installing and supervising installation of Bowen systems onsite at various locations around the world. His hobbies are spending time with his wife, kids and dogs, and also installing car audio equipment on his off time. When Phil Groce joined the BT team he brought half a century of planetarium and exhibit experience to Bowen Technovation. His theater designs are world famous for their innovation and a practical approach to applying theatrical techniques and media technologies to planetariums and fulldome theaters. Just as extensive is Mr. Groce’s museum and exhibit experience. 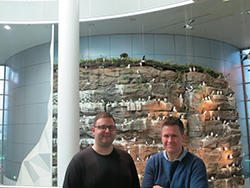 As a former exhibits curator and museum administrator, he understands the inspirational power of informal learning environments like museums, science centers, zoos, and aquariums and treats every exhibition space as a theatrical experience. He also understands the daunting budget forces that these institutions face. HPS will be working with Bowen Technovation’s many exhibit partners, including Sonik Technologies in Europe. 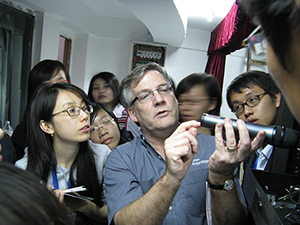 Among Phil’s extensive credentials are IPS Fellow – 1988, SEPA’s Paul Campbell Fellowship Award – 2006, Museum Management Institute/Getty Leadership Institute – 1989, Member of American Association for the Advancement of Science (AAAS). We selected Sonik after interviewing a number of firms and found them impressively honest, knowledgeable and enthusiastic. They have fantastic AV and IT knowledge and will represent us well in the planetarium and exhibit project world. Their home base at the new Perlan Nature Museum, Reykjavik Iceland will serve as a highly advanced demonstration site with an amazing array of modern exhibits and with the launch of their new 15m state of the art domed theatre. Meet them at regional planetarium, museum and science center conferences. We start from generating an AutoCAD or 3Dmax project along with architectural drawings then make sure all the sound systems, video projectors, plasmas, touchscreens, and lighting systems are all installed properly and working together. In addition to providing client training and technical support for years after the installation, we also produce program content for these clients and maintain our own recording studio, video editing and animation suites. Where do we work? With whom? Our team works primarily nationally and internationally on such projects but also has a significant Indiana client base that includes major projects for the Indianapolis Colts, Children's Museum, Indiana State Museum, the new Central Library, Carmel, Lawrence North and Pike planetariums, Pike Center for the Performing Arts and the Internet II 3D visualization theater at the new IUPUI Informatics Center. Am I ready? What is required? If you have an interest in these positions and have been around interior design, audio/video equipment or technology systems we will train you to fit into the slots we have available. The most important qualification is a great work ethic, ability to work well with our other staff and a keen interest in advancing your expertise. A good proficiency in the MS Office bundle is important especially Word and Excel. In some cases, knowledge of AutoCAD is very useful but not required. The building and grounds at Bowen Technovation are a non-smoking workplace. For years BT has been active in preventing smoking on a national level. If you have a recent history of smoking please do not apply.